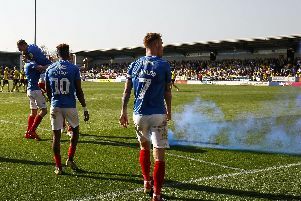 Matt Fish and Alex Wynter have returned to their parent clubs after their Pompey loans were not renewed. The departure of the pair comes as no surprise, with the defensive duo having slipped out of first-team reckoning of late. Decisions still have to be made over the remaining four loanees at Fratton Park, with their spells set to expire in the first week of January. They include Paul Robinson, Marcus Bean, Miles Storey and Lee Holmes. Storey’s loan – like Wynter’s – is for a season, however there is scope for it to be cancelled at the midway point by either party. Fish and Wynter have returned to Gillingham and Crystal Palace respectively.